Before I really get going on this week’s music meanderings, I feel compelled to point out that I’ve removed the “Tuesday” from tunes testing around here. After several weeks of it, I think it’s apparent that Tuesday was wishful thinking at minimum, and straight-up make believe in practice. I really love writing the new music feature, but I think I’m likely to end up making myself look like procrastinating slug-knob if I don’t pull this car over right now and strip the Tuesday off of it. So, there you go. Sometimes? Tuesday. Other times? Who knows. But I promise I’ll get one out each week, if at all possible. 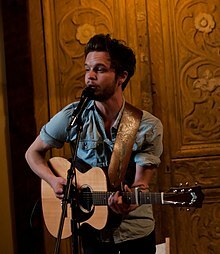 This week’s new band/artist is The Tallest Man On Earth, who is, apparently, a person rather than an ironically named band as I’d assumed. I suppose that in retrospect, any act with a name describing an individual fellow, resident of the Guinness Book of World’s Records or not, should be considered a person until proven otherwise. So, see, I’ve learned something already! The Tallest Man On Earth is Kristian Matsson, who I don’t actually believe is, you know, all that tall. I mean, he’s Swedish, and maybe he’s tall for Swedes, I don’t know. That is, I don’t know either how tall he is nor how he compares to his countrymen. But, really, the height thing isn’t all that important. You probably shouldn’t dwell on it. We should, however, dwell on the fact that I enjoyed listening to two albums this week, The Wild Hunt (2010) and Shallow Grave (2008). Admittedly, there isn’t much difference between the tracks on either, but each is a solid choice if you’re looking for something that’s simple yet still manages plenty of complexity through depth. Simple? Well, as far as music goes, you can’t really get simpler. The whole thing is 95% a guy with an acoustic guitar. That’s it. No bass guitar, no drums, no keyboards, no gospelly (it is too a word) background vocals, no cowbell. Yes, I said no cowbell. Trust me, it’s okay. Fine, if you’re really freaked about it, I guess there’s, like one track featuring piano. So, relax. Complex? The Tallest Man On Earth brings it with thoughtful, lyrical vocals that are some of the most poetic I’ve ever heard from an individual source. Listening to it for the first time, it was impossible not to think of Bob Dylan; I’d imagine there are probably worse things that could be said about you as a musician. It’s folksy, of course, but I’d say that’s to be expected from a gravelly-voiced guy singing with an acoustic guitar. Besides, the world could use a little more folksy every now and then, if you ask me. My biggest problem with The Tallest Man On Earth is that I’m not sure there’s much place for it in my life as “everyday” music. Being as lyrically focused as it is, I would love to see him play a cozy little place with a stage a foot off the ground 10 feet . But if I’m at work or writing (concentrating on something else, in other words), it all fades into a kind of similar-sounding guitar-plucking stream on my subconsciousness picks up on. On a couple of occasions last week, I found myself at the end of the CD without realizing I’d missed most of it. Then again, maybe that’s just me and some undocumented attention deficit disorder. Regardles, if the worst thing I can say about it, though, is that it’s a bit of music that you really need to listen to, well, I’d say that’s not so bad. That’s really kind of the whole theme of tunes testing, to be honest.